On bromance, fanfiction, and writing a gay character in a sci-fi book. (SPOT.ph) Alex London knows a thing or two about life. He’s certainly lived a lot of it. Before delving into the futuristic world he created in his novels, he was once a journalist reporting from conflict zones and refugee camps. He was also an assistant to a Hollywood talent agent and get this, a fully licensed librarian. 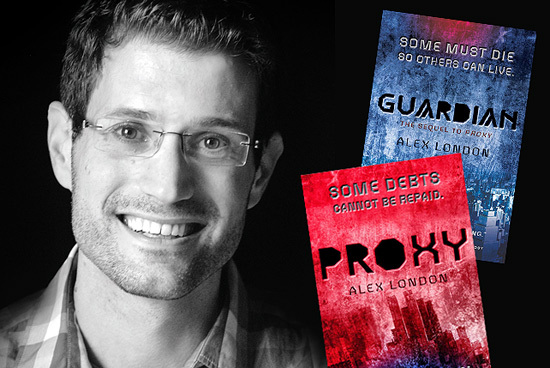 His novel, Proxy, is a young adult sci-fi novel on the friendship between Knox, a boy who gets everything he wants, and his Proxy named Syd, who has to suffer all the consequences and punishments of his actions. They both flee after realizing that they are both victims of a life that is designed for them. Guardian is his thrilling and much darker sequel. We had a chance to sit down with the author as he shared his thoughts on a couple of things. Tell us about your journey to writing. "It started... I guess when I was about 11 years old. I really didn’t like to read. It was never something I ever imagined that I would do but I was forced to by my cruel teachers. My fifth grade teacher made me read a book and he let me choose, and I chose this book called Redwall by Brian Jacques. Redwall was this book about these talking mice who have these battles and all these stuff. I loved it. I have never loved a book before. It changed my life. I loved this story and seeing all the amazing things that books could do and so I wrote the author a letter. "I told him that and much to my surprise, he wrote me back and he encouraged me to keep using my imagination. He told me that I could become a writer one day if I wanted to and that was the first time I realized that that was a thing that was possible. I was hooked on reading and I always had this idea in my head to be a writer. In high school, I fell in love with books and they became my main thing that I was into, and that’s when I get very serious about practicing the craft. I eventually became a journalist and learned about deadlines, and eventually that pivoted into making up stories." You must have led such an exciting life as a journalist. Why the switch to suddenly writing novels? "I’m over the excitement. It was less exciting than it sounds on paper. A lot of it was days of boredom punctuated with moments of terror. (Chuckles.) It got very exhausting. Because what I was writing about was some pretty intense, heavy, and serious subjects, I got tired of human cruelty. I got bored by violence, if that makes any sense. Violence is always the same-how people hurt each other is not all that complicated, but I became very interested in how people heal each other and I think novels are a great way to explore that. It’s this process of how we connect with each other and strangers, and people who are completely different from us. So I embraced that as a new career path to make stories about people who are really nothing like me, and to try and find a way into their lives. The skills I learned as a journalist and the experience I had form all my books and what I write, and they all feed into the characters and situations. But I much prefer what I do now." In your books, you focused on social class, particularly between your two main characters. Is there a reason why? "It’s an issue that concerns me greatly-how we see the "other", someone who is not like us and how we see through our own biases and prejudices about each other. I grew up much more like Knox in Proxy, much more privileged and self-centered. The city I grew up in, Baltimore in the ’90s, it had a lot of problems like down the street from my very fancy high school. I had no idea what happened in those places. I had assumptions about the kind of people who lived there, but the reality of those people defied those assumptions. "All humans are complex. So I wanted to tell this story about these two boys where this entire society was designed around them not meeting each other so I wanted to know, could they learn to see the fullness of each other? It’s learning to embrace the differences we have and realizing that being different is not necessarily being wrong." Is this the same reason you came up with the concept of Proxy? "Yeah! I used the future as a way of writing about the present and the inequality I see in our world, imagining kind of an extreme, futuristic version of it." Most ’Young Adult’ novels have female protagonists. Why focus on male protagonists and their friendship? "I feel like there’s a lot of romance in a lot these [young adult] books, especially in the sci-fi genre. For one, it’s not the kind of book I had enjoyed reading as a teenager so I wanted to write a book I would have enjoyed. Now though, I enjoy all those novels with the romance. And also, sometimes it doesn’t really make sense in those books that people are running for their lives and they have time to stop and make out. There are more serious things to deal with! (Laughs.) So I wanted to do something different than that. "Lastly, friendship is a fascinating subject to me and I think it can be as complex and as interesting or fraught with peril as romantic love, so I wanted to explore that sort of love. I mean, friendship is a kind of love. Knox and Syd’s story really, at its heart, is a story about friendship. It’s a bromance, rather than a romance." Your characters are richly diverse, particularly Syd, who comes from this poor background and who also happens to be gay. Did you write him with this in mind? "He surprised me! It was an organic thing; I hadn’t planned to make him a gay character. When I first started my book and showed it to my publisher, he wasn’t gay and that hadn’t happened yet. My publisher bought it so I finished the book and I wrote and I rewrote and at one point in the process, Syd came out. I wrote that scene in a classroom where he is accidentally outed to his whole class, which is actually something that happened to me in high school. (Laughs.) Once that happened, I thought, ’This makes complete sense’ and I went with it. "I didn’t do it to have this message. I think there is an implied message in it that is true for other characters in this book. I don’t want one aspect of a person’s identity, whether it’s their race or socioeconomic status or their sexuality to limit them to the kind of stories they can be in and see themselves in. Being gay myself, I never got to see a character like me in a futuristic action thriller. Gay teenaged boys are a lot like straight teenaged boys in that they like explosions and adventure, so I wanted to see a hero that teenaged me could have related to. I was excited to create that kind of character. I am glad that readers-straight and gay-are judging Syd by his abilities as an action hero and not who he wants to kiss." Did you get any feedback from the LGBT community? (Nods enthusiastically.) "It’s been great! They really embraced it. I think we’re ready for a gay action hero. People are complicated and they’re more than one thing. To see a book about debt, society, and injustice that has this character... the LGBT community has been very excited. I get emails all the time from gay teens saying how thrilled they are seeing a character like them in a story that wasn’t about being gay or romance or the crisis of sexuality. It’s just a story and Syd happens to be gay. It’s an important part of his identity, it matters to him, and it affects how he sees the world but it’s not the only thing that matters about him. "But what’s been more exciting to me is the response from the straight community who have embraced Syd and don’t judge him for being gay. They’re not afraid to embrace a book that has a gay character even if they themselves are not gay. I think that’s a really cool development, I don’t know if that would have happened to me when I was a teenager. I would have been too scared to read a book that openly had a gay character because I would have thought, ’What if people know my secret?’ Straight guys in my school would have been terrified to do that and go, ’God, what if someone thinks I’m gay? "So I think we’ve come a very long way and there have been a lot of trailblazers before who have helped carve that path. I’m just walking the path. [They’re] writers like Malindo Lo and David Levithan. David Levithan gave me some great advice early on and it’s advice he’s given to lots of people. He said that if there’s a book you want to be in the world and it doesn’t exist, then you should write it. Proxy was that book for me." Did you feel any pressure writing the sequel? "Tons! Sequels are hard and scary! I worried that in continuing the story, I was forcing it or that it wasn’t organic, or that somehow I was betraying the characters. I needed them to still fully be themselves. I had fears that fans who loved Proxy would hate the sequel because it’s a very different book and it deals with the aftermath. Also, I had much less time to write it this time, and I hadn’t planned to write a sequel to begin with. Guardian is much darker and it’s dealing a lot more with trust, regret, and survivor guilt that Syd developed and those are hard issues to tackle." Any plans of making it into a full-fledged series? "Not as of now. I certainly have more stories in that world that I could tell enough. These characters definitely aren’t done with me and I’d like to think I created a world large and rich enough that there’s enough room for all kinds of stories, but I have no plans to create a trilogy or more at this point. I love writing the short stories. (Pauses.) I also love reading the fanfiction! I couldn’t read all of it, I couldn’t possibly. And some of it is obviously better than others but some of the imaginary spaces that other people create in this world excites me. It thrills me that people believe so much in these characters and this world that they want to add their own creation. I just love that." It’s really refreshing to hear that. There are some authors who shy away from fan fiction. "Shakespeare was essentially writing fan fiction based on myths he’d inherited. He was taking characters from his own history-Richard III and Julius Caesar-and writing his own fan fiction about it. They’re giant exercises in fanfiction! For me, Proxy is essentially my retelling of Charles Dickens’ A Tale of Two Cities or The Prince and the Pauper. We all ’steal’ and that’s what fan fiction is, too. It’s like a relay race, you’re passing the baton. So I love it. It thrills me to see that community. Not everyone is a musician but they sit in their rooms and they play their favorite songs, make it a little different and make it their own. That’s what fan fiction is." Any particular writing habits or rituals? "Definitely coffee. I’m an addict. I tend to write better in the morning and natural light, for some reason. But I try not to be a slave to those things. The best writing advice that I ever got when I was starting out is that when you wake up, get up. Wake up and work... treat it like a job. So I get dressed and treat it like my job. Unless I’m on a deadline, I try to give myself weekends. I hold back from writing so that when Monday comes, I’m super excited to get back to work." Do you have any plans while you’re in the Philippines? "I’ll just be in Manila for this trip but what I’ve seen so far, I’ve fallen in love with. So hopefully, I’ll be back and I’ll get the chance to see more." National Book Store is bringing Alex London to Manila for a book signing event on August 30 at 2 p.m. in National Book Store, SM Aura. Proxy (P419 in paperback) and Guardian (P755 in hardcover) are available in National Book Store and Powerbooks nationwide.